1. All dimensions are in inches. 2. Screws shall be free from burrs and sharp edges. 3. Dimensions are to be met after plating. 4. 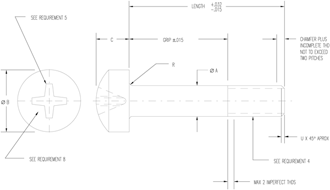 Shank diameter may be .001 oversize for a maximum distance of .031 adjacent to the head. this document will take precedence. 6. Unless otherwise specified, issues of referenced documents are those in effect at the time of solicitation. 8. Items manufactured to Rev. C and Rev. D may be delivered from suppliers stock until depletion. Aluminum Alloy 2024 (UNS A92024) in accordance with QQ-A-430, Temper 2024-D, or QQ-A-225/6, Temper T4. Manganese Bronze (UNS C67000) in accordance with ASTM B138. Alloy Steel 8630 (UNS G86300) in accordance with MIL-S-7839, 26-32 HRC or 8740 (UNS G87400), 4130 (UNS G41300) in accordance with MIL-S-6049. Heat and Corrosion-Resistant Steel, A286 Iron Base Super Alloy (UNS S66286) in accordance with AMS 5731 or AMS 5732. Aluminum Alloy: Anodize, in accordance with MIL-A-8625, Type I or II. Manganese Bronze: Cadmium Plate, in accordance with QQ-P-416, Type II, Class 3. Alloy Steel: Cadmium Plate, in accordance with QQ-P-416, Type II, Class 2. Heat and Corrosion-Resistant Steel: Passivate in accordance with QQ-P-35 after removal of all oil and grease. Passivation verification test per Method 102 of MIL-STD-753. Aluminum Alloy: 62,000 psi min ultimate tensile strength. Manganese Bronze: 85,000 psi min ultimate tensile strength. Alloy Steel: 125,000 to 145,000 psi ultimate tensile strength. Heat and Corrosion-Resistant Steel: 130,000 psi min ultimate tensile strength. 4. THREADS: Threads shall be accordance with FED-STD-H28/2. Acceptability of screw threads shall be in accordance with FED-STD-H28/20, system 21. 5. RECESS: The recess shall be in accordance with MS9006. Add DD before dash number for Anodized Aluminum Alloy Screw. Add BP before dash number for Cadmium Plated Manganese Screw. Add B before dash number for uncoated Manganese Bronze Screw. Add - before dash number for Cadmium Plated Alloy Steel Screw. Add C before dash number for Heat and Corrosion-Resistant Steel Screw. 7. PART NUMBER: The part number shall consist of the basic MS number followed by the material and finish code followed by the dash number. Example: MS27039DD0809 indicates - Screw, Machine - Pan Head Structural, Cross Recessed; .164-32 UNC-3A, .594 length, Anodized Aluminum Alloy Screw. MS27039BP 0809 indicates - Screw, Machine - Pan Head Structural, Cross Recessed; .164-32 UNC-3A, .594 length, Cadmium Plated Manganese Screw. MS27039B0809 indicates - Screw, Machine - Pan Head Structural, Cross Recessed; .164-32 UNC-3A, .594 length, uncoated Manganese Bronze Screw. MS27039 - 0809 indicates - Screw, Machine - Pan Head Structural, Cross Recessed; .164-32 UNC-3A, .594 length, Cadmium Plated Alloy Steel Screw. 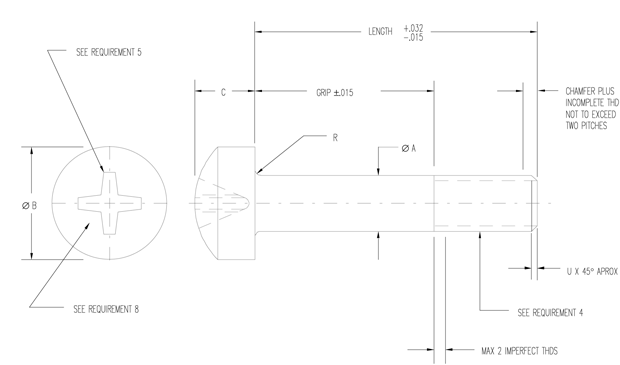 MS27039C0809 indicates - Screw, Machine - Pan Head Structural, Cross Recessed; .164-32 UNC-3A, .594 length, Heat and Corrosion- Resistant Steel Screw. a. Basic part no. and applicable dash no. (Basic part optional for .164-32 screw sizes). b. Material as follows: Aluminum Alloy - none, Bronze - “B”, Alloy Steel - “-”, Heat and Corrosion - Resistant Steel -”C”. c. Manufacturer’s trade-mark shall be added, location optional.